From late August to early December 2011, I partook in a graduate readings course led by Dr. Tracy Barrett entitled, “Problems in Modern Chinese Historiography.” The course parameters were fairly straight-forward in that graduate students would read approximately 4-to-6 articles or book chapters every week, and with this engage a question posed at the outset of the discussion. Considering that not one of us graduate students had specialized training in the Chinese language, a reasonable thought and question that came up periodically during our weekly discussions was how we graduate students could benefit from such a course? Another question that came up was how we graduate students could potentially benefit others from such a course? A third question (in part rhetorical) that came up was when the North Dakota legislature would adequately fund the teaching of the Chinese language throughout the North Dakota University System? For some reason there was always laughter after mention of this final statement. Implicit in graduate studies is the idea that the graduate student will be charged with leading future discussions and provoking others to think about history and the philosophy inherent to history. It is up to the graduate student in training to not only think about a topic, but also to think about how to deliver a topic in a sensible way. Anyhow, without getting too far astray from Modern Chinese historiography, below is the final essay submitted to Dr. Barrett at the course end in December 2011. This was 1 of 5 essays each student was required to prepare for the class. The below summative essay frames and addresses the question(s) posed at the outset of this blog entry. It includes APA references and a map, as well as personal photos from a January 2010 trip I took to Beijing. Any insights within the essay results from the protracted dialog between Dr. Barrett, the graduate students, and myself. Any mistakes and inadvertent platitudes are from my own doing. The reality of nineteenth-century China is an imagined geopolitics, a border that reflects an idea of what the state wanted to project to its nation and the world. Historiography continuously demonstrates this as numerous groups in East Asia gained varying degrees power, and geographic placement contributed to the development or dissolution of the groups. The cultural elite in the urban power centers also conceived of how they wanted their nation to operate, adding more irregularities to any “standard” that reflected national unity. The difficulty remained in how peripheral groups within that boundary thought of themselves, especially when their ideas differed with the empire or nation of China. Groups in the countryside understood the power structures of localized kinship networks. Since they were largely illiterate, though, it is impossible to know if they did or did not think of themselves as a unified Chinese whole. Thus, when the problems of modern Chinese historiography are approached, we are left with scholarship that reflects a nation with intense regionalisms. Instead of a unified nation-state, China is replete with regional groups that execute localized administrative, economic, cultural and political control. When it comes to understanding the modernizing tensions that played out in China in the twentieth century, it is necessary to understand how nineteenth-century domestic and non- domestic developments unfolded. The appearance of China on a map differed greatly from on- the-ground realities. Non-Chinese nation-states often conceived of Southeast Asia in broad, imperial terms. Domestic power centers in China, on the other hand, often acted independent of one another and emphasized short-term goals, and this regionalism undermined collective national unity. Taken as a whole, the historiography focusing on this period intentionally or inadvertently notes the variety of regional power-centers throughout China in the nineteenth century. Industrial and religious interests contributed to the irregular development of nineteenth- century China, and disparate Chinese groups acted in their own regional interests. For example, Yuan Bingling’s study of the Kongsis of West Borneo (1776-1884) notes how Chinese miners left the mainland during this period to profit from natural resources on a Pacific island. This group brought its own “superior mining-technology,” and it also emphasized its own religious institutions. This gold mining group was unified by common labor and through cults imported from the motherland, and they reflected one component of mainland regionalism projected onto the Borneo Island. These miners, in turn, arrived to a place that “had witnessed over many centuries a succession of highly structured political organizations.” (Bingling, 2000:1-2) The domestic hardships in China contributed to the gold miners emigration and settlement in the Borneo goldfields, and they eventually “considered these places their new home-land.” (Bingling, 2000:1-2) While the immigrants were connected with mainland China through diasporas, they also created new private and public institutions in Borneo. By no means exhaustive, these two events reflected how problematic it was in the nineteenth century for China to manage itself, all while contending with a variety of modernizing nation-states that sought to exploit its resources. By 1895, Benedict Anderson says the writings of “such Chinese reformers as K’ang Yu-wei and Liang Ch’i-ch’ao, and nationalists like Sun Yatsen, began seeping across” Indochina. (Anderson, 2006:125) Much in the way that Western powers sought to exploit an Ottoman Empire in decline, these Western powers pushed into China to do the same. France swooped in from the south, the British tightened their hold on coastal ports, and Russia appeared to impose on China from the north. As well, Japan appropriated Western technology as quickly as possible, building railroads and increasing their industrial output. Imperial armies required this standardization as a means to project power. Large armies could only become large through fluid power structures that required intense discipline. Japan represented a variety of this intensity, modernizing itself enough so that just after the turn of the century they were able to contest, fight, and defeat Russia. Three decades later, China would be next. Overlapping Western imperial interests competed with local Chinese regionalisms, and by the May Fourth Movement of 1919 the intellectual seeds of national discontent would be planted. As Vera Schwarcz says, “the event of 1919 marked the first of a series of incomplete efforts to uproot feudalism while pursuing the cause of a nationalist revolution.” (Schwarcz, 1985:7) Frederic Wakeman, Jr., pursued this nationalizing angle in Policing Shanghai, 1927-1937, a period in the first half of the twentieth century that marked the start and the finish of the second major attempt at national revolution and reform throughout China. 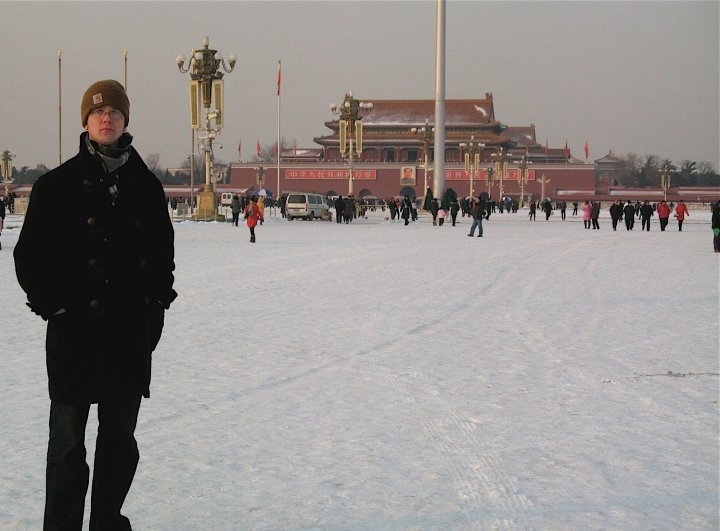 One of the only surviving January 2010 photos of Barth in Tiananmen Square in Beijing, China. When considering this as a 1980s and 1990s site of revolution, it is also necessary to put this in the context of how Imperial, Nationalist and Communist China dealt with revolutions throughout the nineteenth- and twentieth- centuries. The historiography that focuses on the 1930s and the Second World War reflects at least three points. The first was the growing imperial juggernaut of the modern nation-state of Japan; the second was the increasing influence of Chinese communists; and the third was how domestic Chinese gentry and warlords attempted to maintain some type of local control. This, as Prasenjit Duara calls it, is the “cultural nexus formulation [that] enables us to understand the imperial state, the gentry, and other social classes in late imperial China within a common frame of reference.” (Duara, 1988:15) While groups in China were interlocked in a cultural nexus, the national unification of China came when the Japanese Imperial Army initiated its invasion in 1937. Individuals operating within the Chinese cultural nexus had degrees of agency, as did regional groups, but they were not unified under a central cause. Thus, the Chinese communists could not gain overwhelming support until the Japanese invaded and began their systematic extermination of approximately 15 million Chinese peasants. The Chinese communists armed the illiterate peasants with weapons and the technology of vocabulary, and this allowed them to articulate a standardized set of grievances. Chalmers Johnson studied the vocabulary of the Chinese peasantry, and noted how by 1945 one-fifth of the Chinese population lived in communist guerilla bases. (Johnson,1962:1) If in the communist bases, the peasants were therefore under the standardized communist power structure. That the communists could articulate a standardized set of grievances for the peasants meant that the communists could also help the peasants imagine a standardized Chinese nation, complete with defined geopolitical borders. Imagining China as a modern nation-state is a central problem inherent to Chinese historiography. It is all the more problematized when historians do not define modernity; or whether modernity is a perpetual process; or if there are different roads of modernity; or if modernity can be achieved and supplanted by post-modernity. These interpretations often cause historians to tweak existing theories, or it causes scholars to revise entirely or become entrenched and defend decades of professional work — egos are often at stake as well. Yet even though historiography can at the outset appear complex, a reader is still able or allowed to construct some sense from it. In the case of Chinese historiography, the works of Yuan Bingling and Franz Michael provide a nineteenth-century foundation for understanding how intense regionalisms undermined imperial Chinese rule — in the case of the Taiping Rebellion, it was this regionalism that forced the emperor to execute his rule. Prasenjit Duara, Vera Schwarcz, Frederic Wakeman, Jr., and Chalmers Johnson bring the historiography up through the first half of the twentieth-century by demonstrating how different Chinese groups and non-Chinese nations asserted power, Confucian kinship networks, Max Weberian (a hybrid of Darwinian-Industrialist) capitalism, and proletariat revolutions throughout the nation and regions of China. 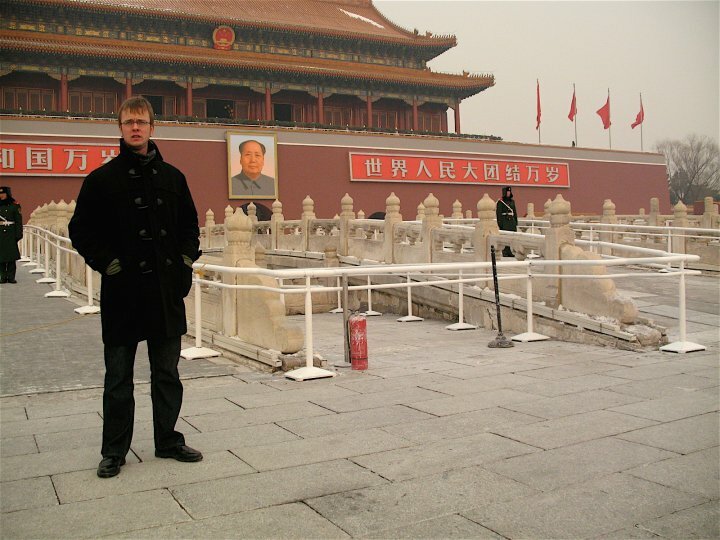 Barth refers to this photo as "Mao and Me" even though there are two additional Chinese guards within the shot. Photo taken in Beijing, China, January 2010. Paradoxically, the national unification of China did not happen until a non-domestic Japanese Imperial Army brought China together through systematic and protracted atrocities between 1937 and 1945. After the retreat and surrender of Japan in 1945, the United States, Allied Europe, and the USSR focused on the reconstruction of the Axis nations and power-struggles inherent to a Cold War. Any power vacuum that remained in China was uncontested and seized by the communist party, and Mao realized this at the national level by 1949. Today the Chinese government continues efforts to industrialize, standardize, and modernize its nation-state. That it has not achieved complete industrialization within the imagined borders of its nation means that many parts of China remain pre-Industrial. In this way the nation-state continues down its own perpetual road of modernity. 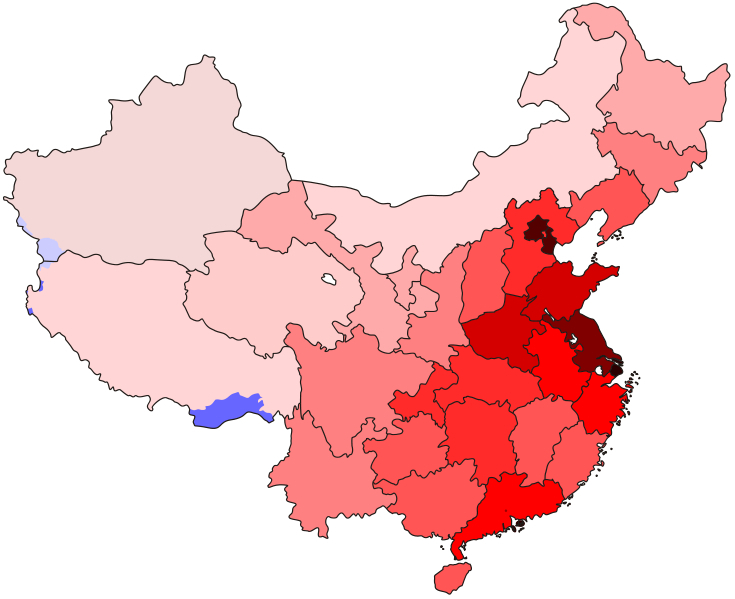 The political power-center continues contending with the tensions produced between existing regionalisms (for example, struggles around Tibet, and in western China, where Islam has increasingly concentrated influence) all while attempting to hold on to some semblance of culture that manifests itself in a Confucian-Communist hybrid revolving around a deified Mao. All of this is supposed to hold the nation together while China technologically pushes itself and its citizenry forward. The flurry of European and American industrialists within today’s nation-state of China appears analogous with much of the imperialism it endured in the last century and a half. That the Chinese government allows industrialists and capitalists into its country also raises questions as to whether the authorities in power are content with projecting a communist image of a unified community, or an imagined nation-state with undertones of intense regionalisms. It is unlikely that historians are going to resolve these problems any time soon, especially considering how new archival material continuously problematizes the traditional and contemporary historiography of modern East Asia. 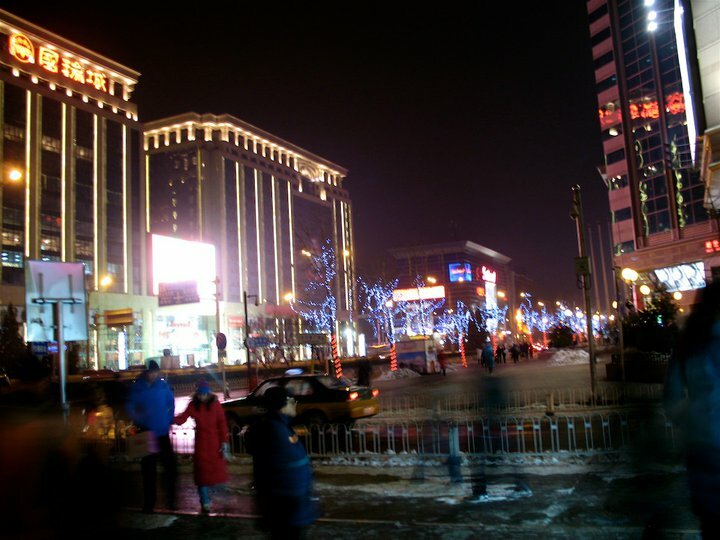 Photo of downtown Beijing taken in January 2010. Anderson, Benedict, Imagined Communities: Reflections on the Origins and Spread of Nationalism (London & New York: Verso, 1983, 1991 & 2006). Bingling, Yuan, Chinese Democracies: A Study of the Kongsis of West Borneo, 1776-1884 (University of Leiden, the Netherlands: Research School of Asian, African, and Amerindian Studies, 2000). Duara, Prasenjit, Culture, Power, and the State: Rural North China, 1900-1942 (Stanford University Press, 1988). Johnson, Chalmers, Peasant Nationalism and Communist Power: The Emergence of Revolutionary China, 1937-1945 (Stanford University Press, 1962). Michael, Franz, The Taiping Rebellion: History and Documents (Seattle and London: University of Washington Press, 1966). Schwarcz, Vera, The Chinese Enlightenment: Intellectuals and the Legacy of the May Fourth Movement of 1919 (University of California Press, 1985). Wakeman, Jr., Frederic, Policing Shanghai, 1927-1937 (University of California Press, 1995). This entry was posted on Tuesday, December 20th, 2011 at 12:04 pm	and posted in Uncategorized. You can follow any responses to this entry through the RSS 2.0 feed.